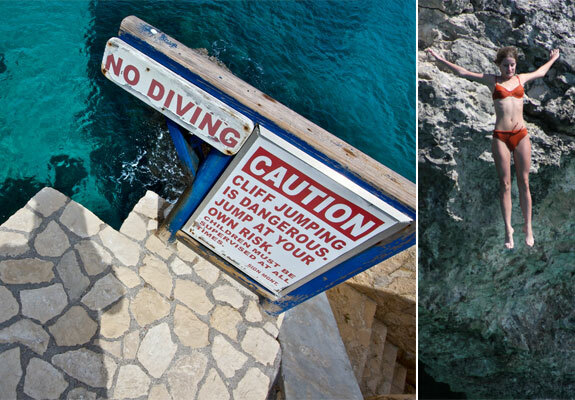 When the likes of Harrison Ford, Scarlett Johansson, Bono and the Sports Illustrated swimsuit photographers visit Jamaica they head to the caves. 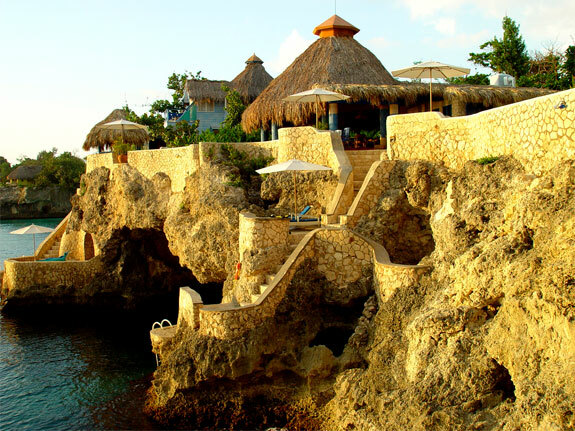 The Caves Resort, that is, a luxurious-rustic getaway located in Negril—Jamaica’s “capital of casual” famous for its Caribbean sunsets and Seven Mile Beach. 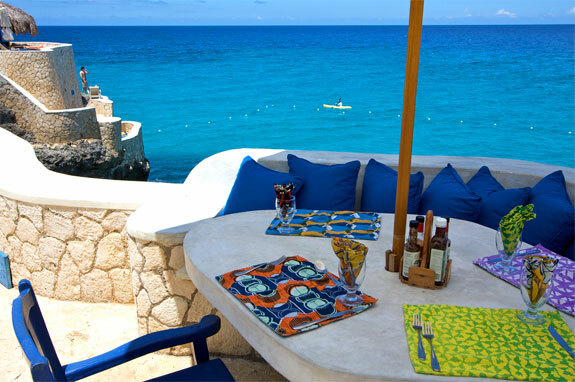 Celebrities are drawn to the Caves Resort partly because it is owned by one of their own, legendary music producer Chris Blackwell (who also hosts the Flashpoint Film Festival here). And partly because, well, it is one cool place to stay. 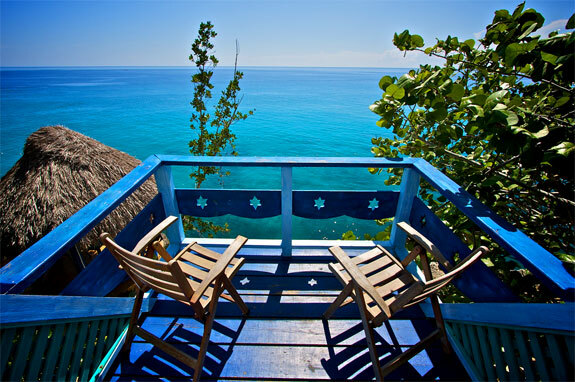 Accommodations at The Caves consists of 12 individually styled cliff top cottages and suites. 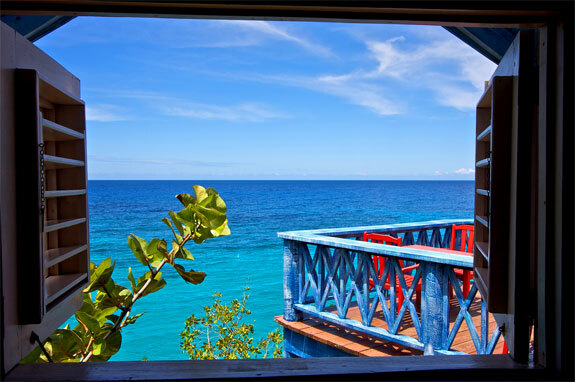 Our favorites are those with the viewpoints from highest above the water, like the one-bedroom Butterfly and the two-bedroom Moonshadow and its glorious blue rooftop balcony (see pic below). All rooms at The Caves are designed with guest privacy in mind. Loads of lush vegetation creates a sense personal space and provides that in-the-middle-of-a-garden vibe. But there are plenty of mingling areas around the resort too. 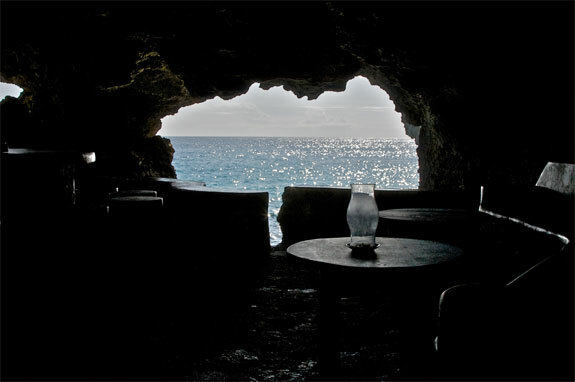 Coolest among them (both literally and figuratively) is the Rum and Cigar Bar located inside an open-ocean cave underneath the resort. 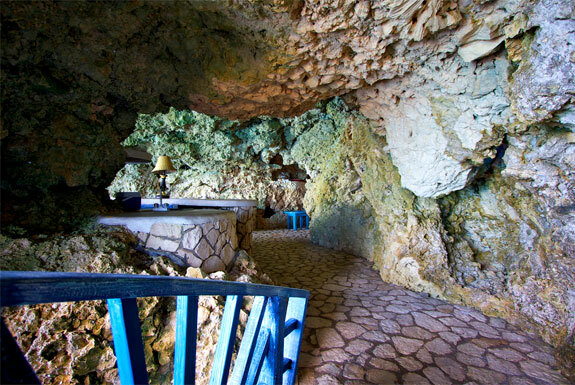 The whole of the Caves Resort, in fact, is built upon limestone cliffs and a honeycomb network of caves. Which may have you asking yourself: Why anyone would stay at a high-end Caribbean coastal resort that doesn’t have beach access? The answer is that the cliffs of The Caves are arguably better than having beach access. 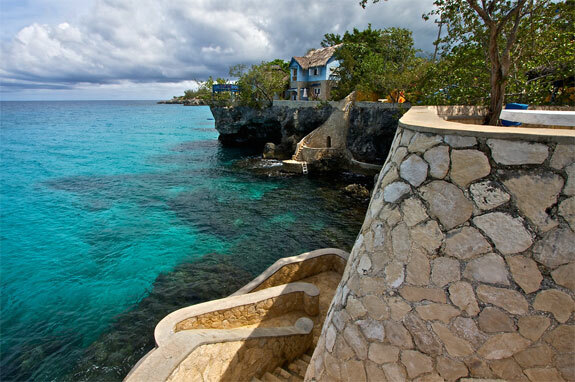 Perched so above the water, the Caves Resort has more dramatic views and cooler breezes. 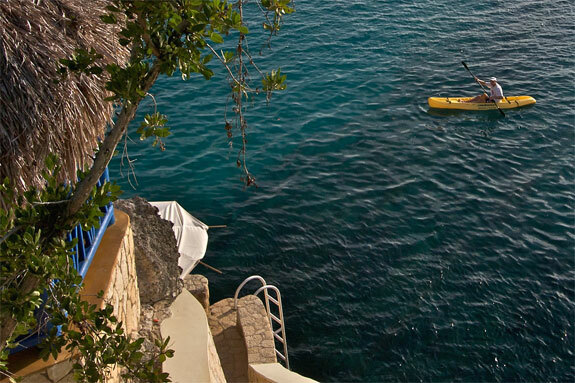 Caves guests are never far from a Caribbean swim, either by climbing down to sea level or, for more adventurous souls, jumping in from the cliff top. 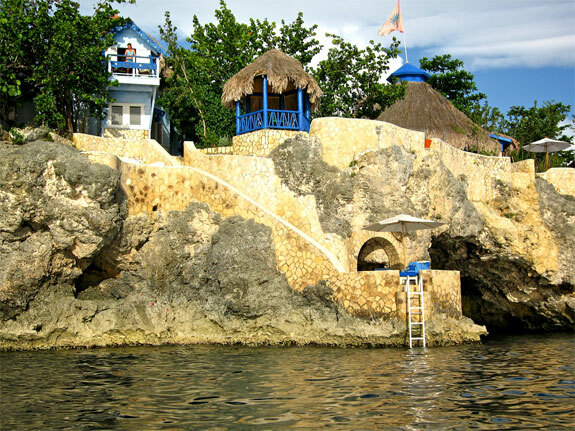 The resort also has a saltwater pool, a cliffside jacuzzi and a private hot tub located inside a cave. 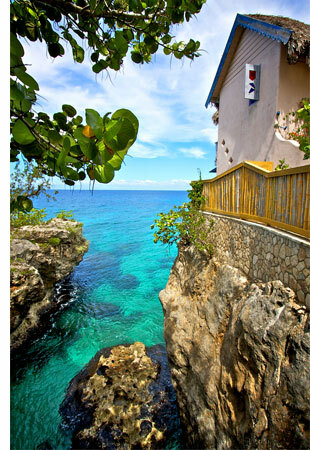 For guests still craving sand, Negril’s main beach is about a 10 minute taxi drive away. All that said, Spot Cool Stuff does not recommend The Caves for a honeymoon stay. 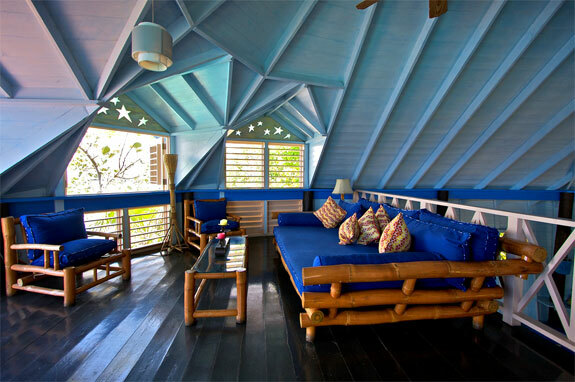 The villas, while beautiful and comfortable, are not air conditioned and a bit too close-to-nature for some. There’s also the possibility that the resort will be taken over by a magazine doing a photo shoot during your stay. 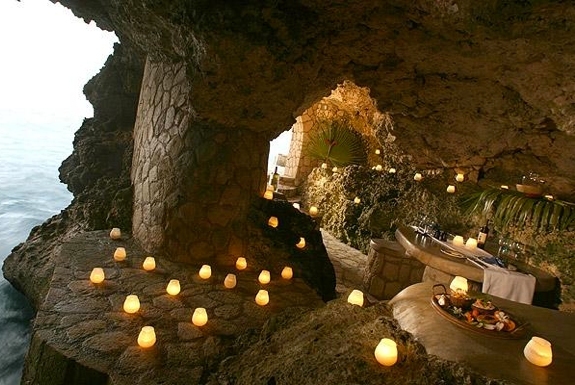 As a choice for a romantic indulgence with an unusual cave twist, though, the Caves Resort is brilliant. And who knows? You may have a brush with fame during your stay. 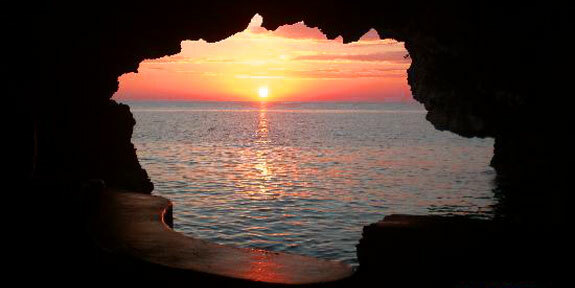 Money saving tip: Want to stay at The Caves but can’t afford the $550/night price tag? Consider the $80/night quirky Blue Cave Castle instead; its a Spot Cool Stuff favorite. Jamaica is one of my favourite places. Admittedly, it is an acquired taste. But this is a resort that I need to check out.